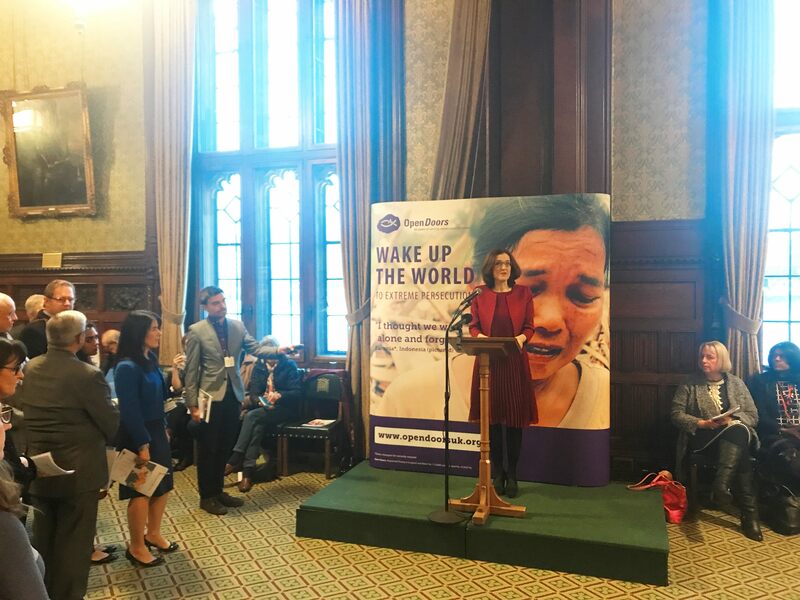 87 parliamentarians were present for the launch of the 2018 World Watch List, hosted in the House of Commons today by Theresa Villiers, MP for Chipping Barnet. This report was produced by the charity, Open Doors, and lists 50 countries where Christians face violence or other forms of oppression and unfair treatment. Open Doors campaigns for the right of Christians to practice their faith without persecution or interference. For several years, they have produced an annual report on the most difficult places in the world to be a Christian. Guest speakers included Hannah from Pakistan and Michael from Egypt. These are assumed names. The speakers felt they could not use their real names for fear of reprisals when they returned home. For the same reason, those attending the launch were asked not to take photos of either speaker. In her speech to open the event, Theresa Villiers said: “This report has three main messages. The first is that the level of persecution and oppression of Christians around the world continues to increase in many countries. Over 3000 Christians are known to have been killed for their faith in the 2018 reporting period, a figure which is twice as high as last year. And of course that is only the verified cases. The real figure is likely to be much higher. North Korea continues to top the list as the most difficult place to be a Christian. In Pakistan 168 churches have been attacked and the situation faced by Christians in Afganistan has worsened. For many around the world, their Christian faith puts them in danger of physical attack. In some places, women are particularly vulnerable. This is documented on page 13 of the report where it recounts the horrific experience of 17 year old Esther at the hands of Boko Haram militants in Nigeria. The second key message which Open Doors would like you to take away from this meeting is that many Christians face non-violent persecution. Open Doors emphasise how pervasive, threatening and distressing this type of treatment can be. It can affect every part of an individual’s life, their jobs, their businesses, their mental health and their access to healthcare, their children’s education. It can affect every stage of their life from cradle to grave. This kind of harassment and discrimination can have devastating effects. Whether it is surveillance of Christians on North Korea or demolition of churches in Sudan, its aim is to stamp out the Christian faith wherever it is found. What is more, the squeeze of non-violent persecution can quickly turn into the smash of violent persecution. The third and last theme to highlight from the report is set out on page 27. That is the message for us, the parliamentarians. It tells us what we can do to help. Open Doors want us to press our government to use its foreign policy, its aid and trade arrangements, and its influence on the global stage to champion the right of Christians to practice their faith without interference or attack from others. Proceedings were brought to a close with a speech from Lisa Pearce, CEO of Open Doors, UK and Ireland and a question and answer session. The World Watch List 2018 can be downloaded from the Open Doors UK website.